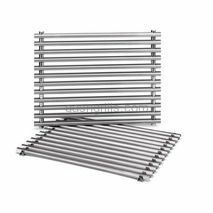 Weber stainless steel flavorizer bars. Fits Platinum Series I & II and Genesis 1000-5000 gas grills. 8 short and 5 long bars. 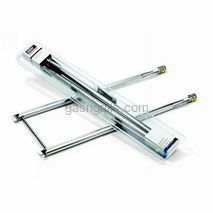 Dimensions : Short: 15.8" X 2.1" X 1.6" - Long : 23.4" X 2.1" X 1.6"
Weber Stainless Steel Flavorizer Bars. 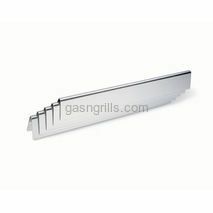 Fits Genesis E and S Series gas grills. 5 bars. 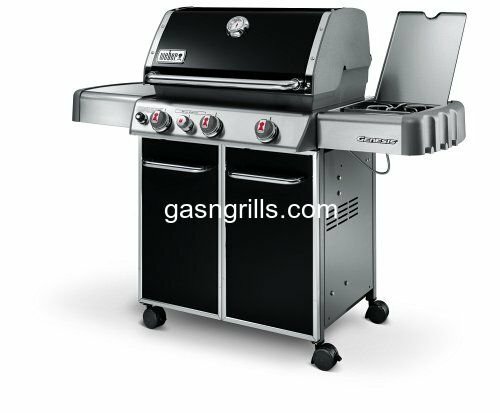 Dimensions: 24.5" X 2.3" X 2.3"
Weber Genesis 300 Series flavorizer barts. 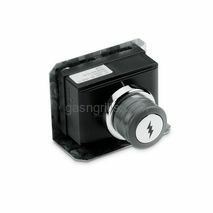 Fits Genesis E and S series Gas Grills with front mounted control panel. 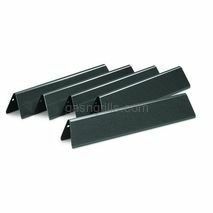 set of 5 bars. 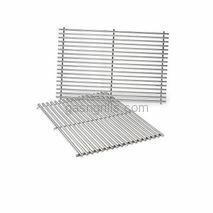 Dimensions: 17.5" X 2.2" X 2.3"
Stainless steel cooking grates(set of two). Fits Genesis® Silver A and Spirit® 500 gas grills. 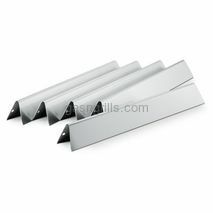 Dimensions: 14.9" X 22.6"
Stainless steel Flavorizer® bars (five bars). Fits Genesis® Silver B & C, Gold B & C (2002 and newer models), Genesis® Platinum B and C (2005 model), Spirit® 700, and Weber® 900 gas grills. 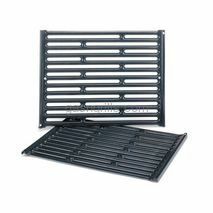 Dimensions: 22.5" X 2.2" X 2.3"
Weber Porcelain-Enameled Cast Iron Cooking Grids. Fits Weber Spirit 300 Series Gas Grills with front mounted control panel. 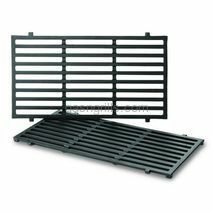 Dimensions: 17.5" X 23.8"
Porcelain-enameled cooking grates(set of two) Fits Genesis® Silver B & C, Gold B & C and Genesis® 1-3500 gas grills Dmensions: 17.4" X 23.6"
Weber Porcelain-Enameled Cast Iron Cooking Grids. Fits Weber Spirit 200 Series Gas Grills with front mounted control panel. 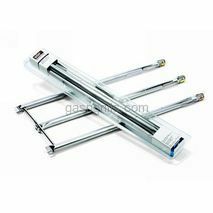 Dimensions: 17.5" X 20.4"
Package includes (3) stainless steel burner tubes, (1) crossover tube, hardware, and instruction sheet. Kit fits Genesis® 1-5500, Genesis® Gold B & C (prior to 2002 model year) & Genesis® Platinum B & C, and Platinum® I & II gas grills. 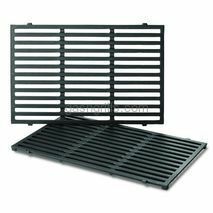 Dimensions: 29.2" X 1"
Porcelain-enameled cooking grates(set of two). Fits Genesis® Silver A and Spirit® 500 gas grills. 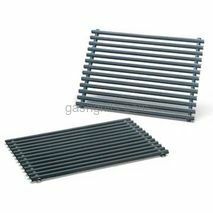 Dimensions : 15" X 22.6"
Porcelain-enameled Flavorizer® bars(five bars). Fits Spirit® 500 and Genesis® Silver A gas grills. 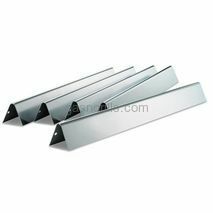 Dimensions: 21.5" X 1.7" X 1.7"
Porcelain-enameled Flavorizer® bars(five bars). Fits Spirit® 300 series gas grills with front mounted control panel. 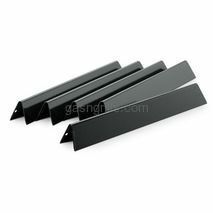 Dimensions: 15.3" X 2.6" X 2.5"
Porcelain-enameled Flavorizer® bars(five bars). Fits Genesis® 300 series gas grills with front mounted control panel. 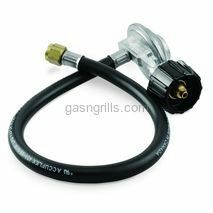 Dimensions: 17.6" X 2.3" X 2.2"
Weber QCC1 Hose & Regulator 14.5"
Kit contains (1) 14.5" QCC1 hose and regulator and instruction sheet. Kit fits Genesis® Silver A & B gas grills. Does not fit grills with side burners. Please see part number #303603 if your grill has a side burner. 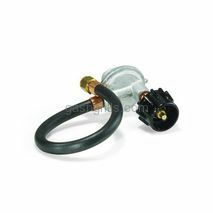 Weber QCC1 Hose & Regulator 21"
Package includes (1) 21-inch QCC1 hose and regulator and instruction sheet. Kit fits Genesis® Silver C, Genesis® Gold B & C, Genesis® Platinum, and Summit® Silver & Gold gas grills. 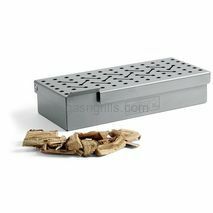 Weber Stainless Steel Smoker Box hinged lid with large tab allows you to easily add chips while in use. 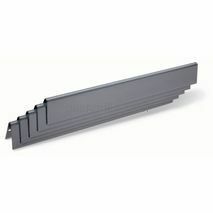 Fits Weber Q 2000 series and large gas grills.